Bhubaneswar: Reliance Industries Ltd (RIL) Chairman Mukesh Ambani today said that his company has already invested Rs. 6000 Crore in Odisha and will invest additional Rs.3000 Crore in the state. 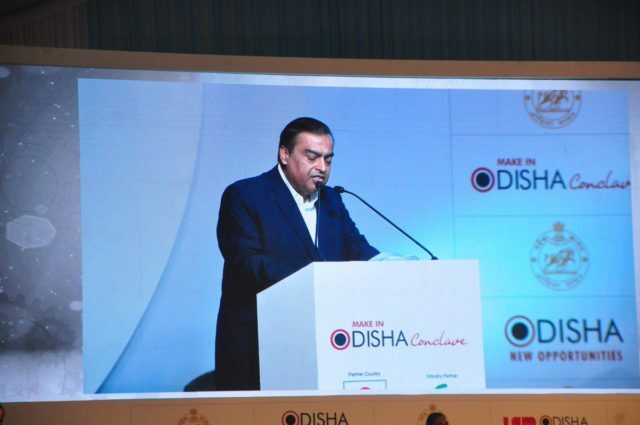 “Reliance has already invested over 6,000 crores in Odisha. And today am committing to invest an additional 3,000 crore in the next three years in our various businesses in Odisha,” said the business tycoon, adding that the investment create 30,000 job oppurtunities in the State” he said during the Business Leadership summit in the Make in Odisha Conclave here. Speaking about the company’s telecom arm, Ambani said Reliance Jio has connected all cities, towns and 43,000 villages in Odisha and the per capita data consumption in the State is among the highest in the country. He further added that the company is working with the State Government to integrate lakhs of women in the digital mainstream under Mission Shakti scheme. “We are working with the Odisha Government to empower people through the Shakti scheme. Together with all of you, we are committed to making Odisha one of the most developed digital state in the nation,” said the industrialist.